It's been a crazy few weeks around here and it is only shaping up to be busier and crazier right through the summer! Little G and I headed to Drumlin Farm and Wildlife Reserve about a month ago. 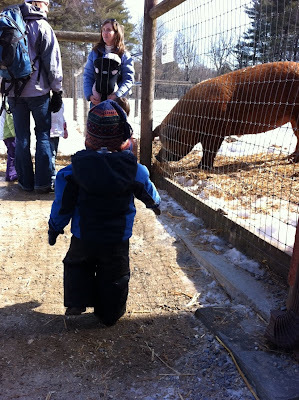 Most of our activities that week had been canceled because it was school vacation week, and I refused to go to the Children's Museum that week, so we headed out of the city to this really great farm. A veteran mommy gave me the best advice...she had me put Little G in snowpants. BRILLIANT!! There was LOTS of mud and it was his first time exploring such a fun walking surface, so I was extraordinarily glad to have the snowpants! We saw lots of farm animals, but since I was on my own, I didn't get a lot of pictures. We did get a picture of this SUPER HUGE PIG!!! And a fun one of Little G staring at some cute baby goats. He would see an animal and point and exclaim the animal's name loudly over and over. Tooooootally worth going just to see his amazement that there are animals that really live outside of his books! Another fun activity we did that week was making a rice bucket. Theoretically, he can play with the rice in the bucket much like sand and it is a great tactile, indoor activity. Of course, nothing could trump the fun of pouring the rice out onto the wood floors and hearing each and every grain bounce away! We headed to Central PA to visit with Gram and Cousin W. There is a place there called Monkey Joe's, which is a playspace in a large warehouse that has HUGE inflatable bouncy houses with all sorts of crazy mazes and slides. When we got there, Little G was none too impressed with the toddler bouncy house that we were in. He wanted nothing to do with it until I showed him that he could push me over and I would just bounce. THEN he decided it was the coolest thing ever!! He did a couple of the small toddler slides, and then we took him on the BIG ones...the following three videos are shot on the two tallest slides. The first one my mom took of us...the second and third one I took from inside the slide once I had climbed up the stairs....and let me tell you THAT is a work out!! Seriously...imagine carrying thirty pounds up a ladder that isn't stable because it's really just air! There's a reason I am completely out of breath in every video! When we got back from PA we headed out the next day to Rochester to visit our new cousin, H. We wen't to the children's museum there and it was totally awesome. Little G had a blast in a 'sand pit' filled with a plastic medium...he would have his dad fill a bucket and then Little G would pour it all over himself. Needless to say, this has encouraged some new ideas for him with his little rice bucket! 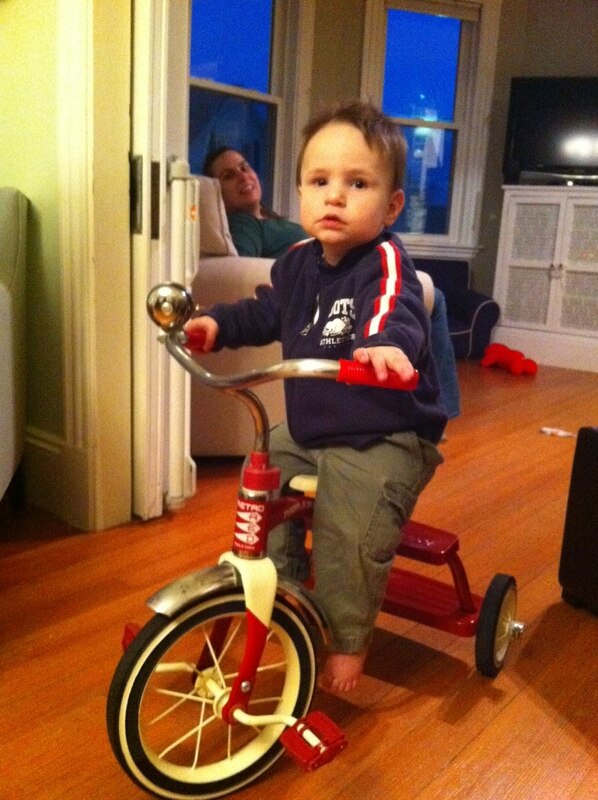 Not too long after we got back from Rochester, our neighbors came over and gifted Little G with this refurbished tricycle. Our neighbors are both mail carriers and Mr J found a rusted out tricycle on his route when Little G was only two weeks old and has been refurbishing it ever since!! It is GORGEOUS!! And so incredibly thoughtful. We'll have to put some blocks on the pedals so Little G can reach them, but he already loves it. The winter has been so cold and dreary and loooooooong and we are all getting very restless, so it has been hard to keep Little G entertained all day. He really wants to move and get around, and there just isn't that much to do in our house. A few weeks ago, my husband had Little G on the guest bed and he stood right up next to the headboard, grabbed on and started jumping. He thought it was the coolest thing ever...so we gave in and got him his own mini-trampoline. This video is from the very first time he got on it...even just a day later, he has figured out how to get air on the thing!! Spring and warm weather can NOT come soon enough in this house! I am amazed when I walk into day care and they have the toys-in-the-rice-box activity and Anna isn't conniving them into letting her dump the rice into a smaller, too small, vessel and missing 90% of the pour. Also, I found the same tricycle in the garbage and this year Anna finally reached the pedals! It's great, we did some of our family portraits with her on it. I love it.